The Copenhagen Harbour Baths (Danish: Københavns Havnebade) are a system of recreational bathing facilities along the waterfront of Copenhagen, Denmark. There are currently four harbour baths, the first and best-known of which is located at Islands Brygge. The harbour baths serve as a supplement to the beaches around the city, such as the extensive urban beach at Amager Strandpark. In 2010 the Royal Danish Theatre also established the temporary artificial Ophelia Beach on the Kvæsthusbroen pier next to the Royal Playhouse. For the swimming season of 2002, the harbour bath at Islands Brygge opened as the first harbour bath in town. In 2003 the harbour bath was towed to the other side of the harbour and set up at Fisketorvet, while Islands Brygge got a new larger and permanent harbour bath designed by PLOT. In 2010 the third harbour bath opened at the Svanemølle Bay after several delays and changes to the design. The harbour bath at Islands Brygge (55°40′07″N 12°34′39″E﻿ / ﻿55.6686°N 12.5776°E﻿ / 55.6686; 12.5776﻿ (Harbour Bath Islands Brygge)) has a total of 5 pools and a capacity for 600 people. It is 7 meters deep. There are two pools dedicated to children, two 50-metre pools for swimming and a diving pool with three and five metre springboards. The project was completed in 2003 by JDS Architects and Bjarke Ingels Group. Copencabana (the name being a portmanteau of Copacabana and Copenhagen), or Harbour Bath Fisketorvet, lies next to the Fisketorvet Shopping Centre and Havneholmen in Vesterbro (55°39′46″N 12°33′50″E﻿ / ﻿55.6627°N 12.5640°E﻿ / 55.6627; 12.5640﻿ (Harbour Bath Fisketorvet)). It is a 650-square-meter complex with three pools and springboards of 1 metre, 2 metres and 3 metres. Svanemølle Strand on a gloomy day. Svanemølle Beach is located in Svanemølle Bay in Østerbro (55°43′12″N 12°35′02″E﻿ / ﻿55.7201°N 12.5838°E﻿ / 55.7201; 12.5838﻿ (Svanemølle Beach)) and was inaugurated on 20 June 2010. It provides 4,000 square metres of beach with family-friendly low waters, as well as a 130-metre-long pier providing direct access to deeper waters. The newest venue, at Sluseholmen in South Harbour (55°38′47″N 12°33′13″E﻿ / ﻿55.6465°N 12.5537°E﻿ / 55.6465; 12.5537﻿ (Harbour Bath Sluseholmen)), was inaugurated on 16 December 2011. ^ "Det Kongelige Teater åbner strandbar". AOK. Retrieved 2010-07-11. ^ a b "Københavns Havnebad Islands Brygge". AOK. Retrieved 2009-05-02. ^ a b "Ny strand åbner i København". Politiken. Retrieved 2010-07-11. ^ "Harbour Bath in Islands Brygge", Architecture News Plus. Retrieved 10 October 2012. ^ "Copencabana – Havnebadet ved Fisketorvet". AOK. Retrieved 2009-05-02. ^ "Havnebadet Sluseholmen". KUBIK. Københavns Kommune. Retrieved 2012-03-26. Assistens Cemetery in Copenhagen, Denmark, is the burial site of a large number of Danish notables as well as an important greenspace in the Nørrebro district. Among the latter are the Nobel Prize-winning physicist Niels Bohr and a number of American jazz musicians who settled in Copenhagen during the 1950s and 1960s, including Ben Webster and Kenny Drew. The cemetery is one of five run by Copenhagen Municipality, the cemeteries are Vestre Cemetery, Brønshøj Cemetery, Sundby Cemetery. In Medieval times intramural interment was the rule although outdoor graveyards gradually became more common, in 1666 the Naval Holmens Cemetery was moved from its original location at Church of Holmen to a site outside the Eastern City Gate as the first burial facility to be located outside the city. An outbreak of plague in 1711 which killed an estimated 23,000 citizens put the burial sites under so much pressure that up to five coffins were sometimes buried on top of each other. After some negotiations it was decided to place it outside the Northern City Gate, the new cemetery was inaugurated on 6 November 1760. It was enclosed by a built by Philip de Lange. Originally the cemetery was intended as a ground for paupers. Simon, der dort Gräber ist, gesprochen habe and he was soon followed by other leading figures from the elite and the cemetery soon developed into the most mondain burial ground of the city. Around that time, excursions to the cemetery with picnic baskets and it is certainly one of the most beautiful graveyards in Europe. The excursions sometimes evolved into rowdy gatherings and legislation was passed to prevent this, a commission established in 1805 issued instructions which prohibited the consumption of food or drink as well as music or any other kind of cheerful behaviour in the cemetery. The gravediggers, who lived on the premises, were to enforce these restrictions, legislation from 1813 prohibited them to sell alcohol to visitors to the cemetery. Despite all these efforts, the peace and quiet was a long time in coming. For particularly grand funerals, crowds of spectators would gather, to reduce numbers of visitors, there was talk of introducing admission fees, but this was never carried out. Sluseholmen is an artificial peninsula in the South Harbour of Copenhagen, Denmark. It takes its name from Slusen, a lock immediately to the south and it is connected to Teglholmen by the Teglværk Bridge. Sluseholmen used to be dominated by industry, including a Ford car factory. As industry left the area, a plan was conceived to develop Sluseholmen into a canal district and this was the result of co-operation between Sjoerd Soeters, the Port of Copenhagen and the City of Copenhagen. Construction started in 2004, the first residents arrived in 2007, Sluseholmen today is dominated by the Sluseholmen Canal District development of 1,150 apartments, located on artificial islands and separated by dug-out canals. Its design has been inspired by the tower on Langebro. Along the eastern waterfront of the district lies a row of old, brightly-painted wooden sheds. When the canal district was planned, the intention was to relocate the boat club. Ultimately it was decided to spare the boat club and its premises to preserve the atmosphere, create an appealing juxtaposition of old and new. Kongens Enghave, known as Sydhavnen, is a district in southern Copenhagen. Since the turn of the millennium, this picture is starting to change, a significant cluster of IT and telecommunications companies have emerged in the area. Kongens Enghave covers an area of 4.46 km², has a population of 15,414 and it used to be one of 15 administrative districts of Copenhagen, but since an administrative reform in 2006-08, it has been part of the official district of Vesterbro/Kongens Enghave. Kongens Enghave is bounded by the Carlsberg area to the north, Vesterbro to the north-east and Valby to the west, while Copenhagen Harbour to the east, Kongens Enghave is first mentioned in 1632. The area was used for harvesting of hay for the stables at Copenhagen Castle. In 1776, a plague hospital was built on Kalvebod Beach. The name Frederiksholm is first seen in 1667–68 when large areas on the coast were reclaimed and drained, the land was divided into 22 estates at the same event. Frederiksholm, the only of houses that still exist today, was built by king Frederick VI. The estate covered about 50 hectares, about half of which was gardens, in 1834, it kept about 40 cows and 10 horses. From the 1870s, it served as residence for the manager of Frederiksholm Brickyard, copenhagens city walls were decommissioned in 1857, leading to new development in the area. Vestre Cemetery was established in 1870, in 1871, two brothers, Køhler, purchased the Frederiksholm estate and established a brickyard in the grounds. The storm surge in November 1872 led to widespread floodings in the area, the brick yard produced many of the bricks used in the construction of Vesterbro prior to its closure in 1918. Karens Minde, an institution, was opened by Johan Keller in 1876. In the beginning of the 20th century, Port of Copenhagen was expanded with extensive docklands with many enterprises in the area. Otto Mønsted opened a factory in 1911. It was joined by Lemvig Møller & Munch amd Sømderværftet, a subsidiary of Københavns Flydeværft & Skibsdok, burmeister & Wain established in the a foundry in the area in 1920 and took over Sønderværftet in 1926. It was temporarily closed by residents in April 2011 while discussions continued with the Danish government about its future, but re-opened to the public. 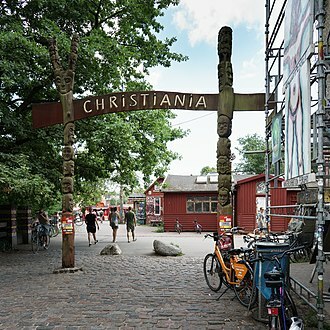 Christiania has been a source of controversy since its creation in a military area in 1971. Its cannabis trade was tolerated by authorities until 2004, in the years following 2004, measures for normalizing the legal status of the community led to conflicts, police raids and negotiations. The area of Christiania consists of the military barracks of Bådsmandsstræde. The ramparts and the borough of Christianshavn were established in 1617 by King Christian IV by reclaiming the low beaches, after the siege of Copenhagen during wars with Sweden, the ramparts were reinforced during 1682 to 1692 under Christian V to form a complete defence ring. The western ramparts of Copenhagen were demolished during the 19th century and they are today considered among the finest surviving 17th century defence works in the world. The barracks of Bådsmandsstræde housed the Royal Artillery Regiment, the Army Materiel Command and ammunition laboratories, less used after World War II, the barracks were abandoned between 1967 and 1971. The adjacent area to the north, was Denmarks main naval base until the 1990s and it is an area in development, home to the new Copenhagen Opera House and schools. An area further north is used by the navy. The outermost defence line, has been renamed Dyssen in Christiania language and it is connected to central Christiania by a bridge across the main moat or can be reached by the path beginning at Christmas Møllers Plads. Four gunpowder storehouses line the redans and they were built 1779-80 to replace a storage in central Copenhagen, at Østerport, which exploded infamously in 1770, killing 50 people. The buildings are renamed Aircondition, Autogena and Kosmiske Blomst and have, although protected, the last Danish execution site, active from 1946 to 1950, can still be seen on the Second Redan close to the building called Aircondition. The wooden execution shed is gone, but the concrete foundation, in total,29 World War II criminals were executed on the site. The last was Ib Birkedal, a high-level Danish Gestapo collaborator, in 2007, the National Heritage Agency proposed protection status for some of the ancient military buildings, now in Christiania. Kongens Nytorv is a public square in Copenhagen, centrally located at the end of the pedestrian street Strøget. The largest square of the city, it was out by Christian V in 1670 in connection with a major extension of the fortified city. Outside the gate, an undulating terrain extended towards the sea, as part of Christian IVs ambitious plans to strengthen Copenhagen as a regional centre, he wanted to double the area of the fortified city, he acquired 200 hectares of land outside Østerport in 1606. To protect the new city district, called New Copenhagen or Saint Annes Town, he started construction of a redoubt, Saint Annes Post, in 1627 a customs house was added at the site. According to a masterplan created by the fortification engineer Axel Urups. Shortly after Christian V was crowned in 1670, he decided to level and this decision was taken mainly for military reasons, its strategic location with almost the same distance to all points along the ramparts of the city making it well suited as a central alarm square. In the same time, the square was to serve as a place royale with inspiration from France, land around the new square was distributed among interested wealthy citizens, including people from the new ranks. Buildings facing the square were required to be in at least two stories and meet certain standards, in 1688, a baroque garden complex with trees around a parterre and a gilded equestrian statue of Christian V in its centre, was inaugurated. In 1747 the entire square was rebuilt by Frederik V as a drill and ceremony ground for the Kings troops until 1908. The equestrian statue of Christian V was created by the French sculptor Abraham-César Lamoureux, dating from 1688, it is the oldest equestrian statue in Scandinavia. Originally made in gilded lead, it was recast in bronze 1939, at the foot of the plinth, Lamoureux placed four allegorical statues. This happened from 1939 to 1942 and the new cast was inaugurated on 22 May 1946, Krinsen is an old form of the Danish word Krans, meaning circle or wreath. Slotsholmen is an island in the harbour of Copenhagen and part of Copenhagen Inner City. The island is dominated by the vast Christiansborg Palace which houses the Danish Parliament, the Supreme Court of Denmark, the Prime Ministers Office, the site used to consist of several small natural islands in the sound between the islands of Zealand and Amager. On the largest of these, Bishop Absalon of Roskilde constructed a castle in 1167. In 1250 the castle was extended with two towers to get the appearance that is now depicted on Copenhagens Coat of Arms. The castle was conquered by the Hanseatic League 1368 and pulled down the year as part of peace terms. Shortly after Copenhagen Castle was built on the site and it became the residence for the Danish king in 1443. However, the took place in a rather haphazard way and continued during the reign of the following kings. Probably during the reign of Christian III a building was constructed on the quay of the canal in front of the castle to house the Chancellery. During the reign of Christian III and Frederick II an arsenal was constructed by the south of the castle. Under King Christian IV Slotsholmen saw considerable development, especially in the part of the island. Here a new harbour was established, surrounded on one side by an Arsenal. Other new buildings constructed were the Stock Exchange and the Brewhouse, all four of these historic buildings are still there today. By the time of the introduction of the monarchy in 1660. During the reign of King Frederick III, further lack of space in the led to the construction in 1665-1673 of an additional building between the Supply Depot and the Arsenal. This building, still visible today, was to house the Cabinet of curiosities of the king, founded about 1650, during the reign of King Frederick IV, a magnificent administration building was constructed in 1716-21 next to the palace adjacent to the Supply Depot. This new building was to house the chancelleries, thus replacing the previous chancellery building situated by the canal, the new chancellery building was connected to the castle by an arched passageway, thus allowing the king to stay in close contact with his government. Recreation is an activity of leisure, leisure being discretionary time. The need to do something for recreation is an element of human biology and psychology. Recreational activities are often done for enjoyment, amusement, or pleasure and are considered to be fun. The term recreation appears to have used in English first in the late 14th century, first in the sense of refreshment or curing of a sick person. Other factors that account for a role of recreation are affluence, population trends. This direction of thought has even extended to the view that leisure is the purpose of work, and a reward in itself. Leisure is considered a right under the Universal Declaration of Human Rights. Recreation is difficult to separate from the concept of play. Children may playfully imitate activities that reflect the realities of adult life, a traditional view holds that work is supported by recreation, recreation being useful to recharge the battery so that work performance is improved. Many activities may be work for one person and recreation for another, or, at a level, over time recreational activity may become work. Thus, for a musician, playing an instrument may be at one time a profession, similarly, it may be difficult to separate education from recreation as in the case of recreational mathematics. Recreation is an part of human life and finds many different forms which are shaped naturally by individual interests. Recreational activities can be communal or solitary, active or passive, outdoors or indoors, healthy or harmful, a significant section of recreational activities are designated as hobbies which are activities done for pleasure on a regular basis. Some recreational activities - such as gambling, recreational use, or delinquent activities - may violate societal norms. Public space such as parks and beaches are venues for many recreational activities. Tourism has recognized that many visitors are attracted by recreational offerings. In support of recreational activities government has taken an important role in their creation and organization, many recreational activities are organized, typically by public institutions, voluntary group-work agencies, private groups supported by membership fees, and commercial enterprises. St Alban's viewed from the south.